ANGELES NATIONAL FOREST >> Investigators recovered skeletal remains found near an overgrown SUV crash scene deep in the Angeles National Forest north of Mt. Wilson on Wednesday, launching an investigation into who the remains belonged to and how the person died, a homicide detective said. Caltrans officials first noticed a set of skid marks about 1:30 p.m. leading off side of Angeles Crest Highway, near mile marker 41.69, Lt. Randy Tuinstra of the sheriff’s La Crescenta Station said. Members of the Montrose Search and Rescue Team descended the steep roadside and found an SUV 500 to 600 feet over the roadside, Lt. Steve Jauch of the sheriff’s Homicide Bureau said. The SUV, which the lieutenant declined to describe in detail, was being overgrown with weeds and foliage. He declined to speculate how many months or years the SUV may have been there. The original skid marks that prompted the search were found to have been the result of an unrelated crash that occurred about a week ago, Jauch said. No body was initially found. But officials returned to the scene Wednesday to resume their search. Search and Rescue officials discovered the skeletal remains “in the vicinity” of the SUV about 8 a.m., Jauch said. The vehicle identification number on the SUV connected it to a missing person’s case launched by the Los Angeles Police Department about two years ago, Jauch said. He declined to discuss the specifics of the LAPD missing person case pending the identification of the remains. “It wouldn’t be responsible,” the lieutenant said. The age or gender of the person whose skeletal remains were found remained a mystery, he said. “We have no idea who they belong to,” Jauch said. 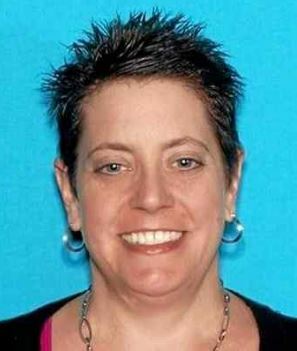 Despite the remains being found near the crashed SUV, Jauch said detectives had yet to determine whether the person had been inside it, or if the location of the remains was yet another coincidence. The Los Angeles County Department of Medical Examiner-Coroner is now conducting an investigation into the identity of the person, as well as the cause of death. 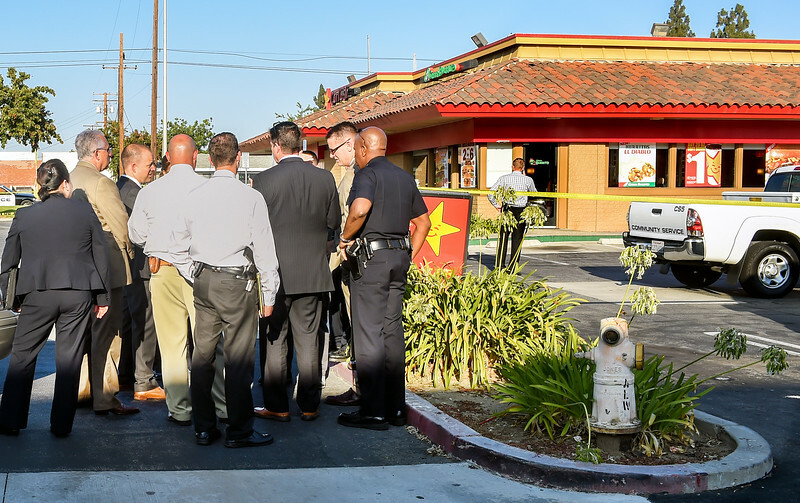 COVINA >> Coroner’s officials have identified a 19-year-old man who was fatally shot by an off-duty reserve Los Angeles police officer during an alleged armed robbery attempt at a Covina Carl’s Jr. restaurant last week. Victor Vidal Sigala died at the scene of the shooting, which took place just before 3:15 p.m. on July 6 at the restaurant at 573 N. Azusa Ave., Los Angeles County Department of Medical Examiner-Coroner Investigator Mario Sainz said. His city of residence was unclear. The off-duty LAPD officer was having lunch when Sigala approached him and brandished a handgun an apparent robbery attempt, Covina police Sgt. Gregg Peterson said. The officer drew his own weapon and shot Sigala, mortally wounding him, police said. The suspect’s gun was recovered at the scene, LAPD officials said. The identity of the involved officer was not released. There was no indication the officer and Sigala knew one another prior to the shooting, Peterson said. Covina and Los Angeles police are working together to investigate the shooting. Anyone with information can reach the Covina Police Department’s Detective Bureau at 626-384-5628. 8SAN GABRIEL >> Two teenage burglary suspects shot by an off-duty Los Angeles police lieutenant during a break-in at his home had been upgraded to stable condition at a hospital Friday as the investigation continued, authorities said. The two wounded suspects, both 17, were ultimately arrested along with two other 17-year-old boys following the shooting, which took place about 10 a.m. at the off-duty officer’s home in the 600 block of Los Olivos Drive, Los Angeles County sheriff’s Lt. Eddie Hernandez said. All four suspects were expected to face charges of burglary. The off-duty officer was awakened by noises inside his home when he encountered two of the teenage burglars, sheriff’s officials said. He armed himself with a non-department-issued 9mm pistol and encountered the two intruders, Hernandez said. They fled from the home through the kitchen window, which is also believed to be how they broke in. The homeowner yelled through the window at the fleeing suspects to stop, Hernandez said. “He saw one of the suspects reach for his waistband and turn towards him,” sheriff’s officials said in a written statement. The off-duty officer fired at the suspect reaching for his waistband, striking both of the teens, Hernandez said. One was struck in the abdomen and leg, while the other was struck in the abdomen. Both continued fleeing. One of the wounded teens was soon found and arrested nearby, officials said. The second wounded suspect was brought to a hospital, along with another teen, shortly after the shooting, Hernandez said. Another teen, who dropped the wounded teen and the other suspect off at the hospital, was found and taken into custody later in the day, Hernandez said. No weapon linked to the suspects had been recovered Wednesday, he said. It was not clear Wednesday whether the two suspects arrested after taking the wounded suspects to the hospital were present at the time of the burglary, Hernandez said. Los Angeles police officials and sheriff’s investigators declined to release the name of the involved officer Wednesday. Detective Meghan Aguilar described the off-duty officer as a lieutenant assigned to the LAPD’s Pacific division with 29 years of experience. The lieutenant has been placed on administrative leave pending investigations by the Los Angeles County sheriff’s Homicide Bureau, the LAPD and the Los Angeles County District Attorney’s Office, officials said. COVINA >> A man accused of stabbing a 23-year-old Glendora woman in an unprovoked attack last week was behind bars Sunday, authorities said. Peter William Cooley, described as a 24-year-old transient, was arrested by LAPD Saturday afternoon, according to Los Angeles County sheriff’s officials and booking records. LAPD officers jailed him in connection with an attempted kidnapping case before realizing he was wanted for the Aug. 2 stabbing at Tri-Community Adult School, 20350 E Cienega Ave. in an unincorporated county area near Covina, sheriff’s Sgt. Nicole Davis said. Further details regarding the alleged kidnapping attempt in Los Angeles were not available. He’s accused of stabbing the victim, a high school acquaintance, as she skateboarded with friends at the school about 12:45 P.M., according to Lt. Andy Berg. Without uttering a word, Cooley approached the woman on a bicycle, then stabbed her four to five times in the torso and arm, Berg said. He then abandoned his bicycle and ran away. The woman was hospitalized in fair condition following the stabbing, officials said. According to county booking records, Cooley was being held in lieu of $100,000 bail pending his initial court appearance. 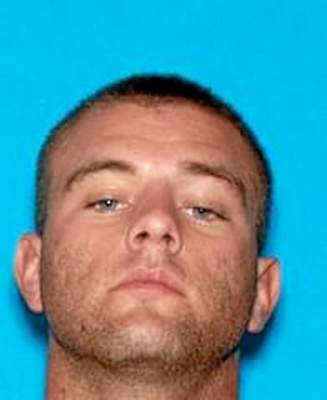 PHOTO of stabbing suspect Peter Cooley, 24, courtesy of the Los Angeles County Sheriff’s Department. Los Angeles police investigating a violent a well-organized Korea Town jewelry store robbery likened to “the plot of a Hollywood movie” Wednesday found and arrested two suspects near Covina before ultimately arresting a total of 10 alleged robbers, authorities said. The robbery and initial two arrests took place Wednesday evening, according to Los Angeles police and Los Angeles County sheriff’s officials. The robbery unfolded about 6:15 p.m. at the St. Cross Jewelry Store inside the Korea Town Center Mall, 928 S. Western Ave., Los Angeles police said in a written statement. “Approximately nine male suspects had violently and with coordinated precision and speed, overpowered employees and took over the store to rob it of its loot of several hundred expensive designer watches,” according to the LAPD statement. The robbers were armed with handguns, as well as sledge hammers. “After overpowering employees and holding them at gunpoint, the suspects proceeded to smash the display cases with the sledge hammers and removed the watches,” the statement said. The crime was over within minutes, and the suspects fled to a getaway van, police said. “From video images inside the store as well as witness accounts, and the fact that the store was inside a mall filled with shoppers, it was obvious this was a well-planned, coordinated and practiced operation,” according to the LAPD statement. LAPD officers tracked two of the suspects to an unincorporated county area near Covina about two hours later via GPS tracking devices hidden inside the expensive watches. Authorities shut down Lark Ellen Avenue between Arrow Highway and Cypress Street as they stopped the car and took two suspects into custody, according to sheriff’s radio traffic. The arrest was handled by LAPD, without direct assistance from local sheriff’s deputies, sheriff’s Lt. Tonya Edwards said. Traffic was reopened within a matter of minutes. 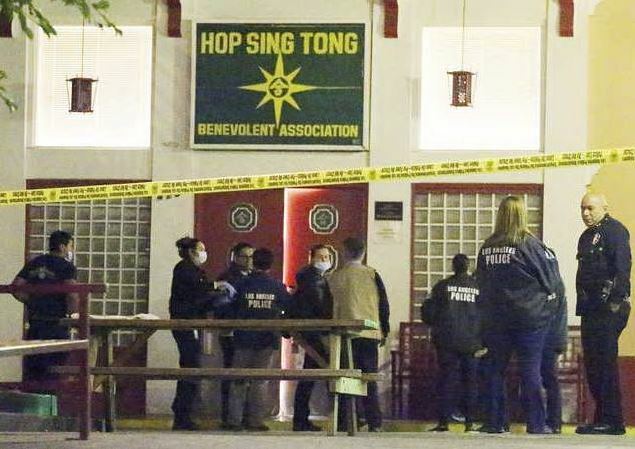 Detectives continued following up on the investigation, ultimately arresting eight more suspects — five of them juveniles — overnight throughout Los Angeles and other nearby cities, according the LAPD. Officers also recovered three guns and several sledge hammers believed to have been used in the robbery, as well as several hundred expensive watches taken in the heist. Police said it was fortunate that no one was seriously injured during the crime. “Although this sounds like the plot of a Hollywood movie, in reality this was a violent and dangerous crime that could have had disastrous results,” the statement said. EL MONTE >> Los Angeles police shot and critically wounded an armed domestic violence suspect in El Monte early Friday at the conclusion of a two-hour car chase that began in South Los Angeles, authorities said. The wounded suspect was rushed into surgery and hospitalized in critical condition following the shooting, which took place about 5:30 a.m. at Valley Boulevard and Mountain View Road, Los Angeles police Lt. John Jenal said. The incident began two hours earlier, when officers from the LAPD’s Southeast Division responded to a report of a domestic assault in the are of 96th Street and Firth Avenue, the lieutenant said. They encountered a victim with significant injuries, but the suspect had already left. Officers spotted the suspect driving a white Toyota minivan nearby and began a pursuit when he failed to pull over, Jenal said. Police used a spike strip to flatten the minivans wheels, but the suspect continued driving on the van’s rims. He stopped the minivan and exited at Elliot Avenue and Cogswell Road, Jenal said. Police first shot at the man with a bean bag gun before opening fire with bullets, he said. The suspect, who was not struck by the gunfire, returned to the minivan and continued driving. The minivan again came to a stop, apparently disabled, at Valley Boulevard and Mountain View Road. Jenal said the suspect suffered multiple gunshot wounds and was in “very critical condition” at an intensive care unit. His identity was not available. He was initially described as about 30 years old. Graphic video of the incident that emerged online showed the suspect brandishing a handgun in the moments before he was shot. The view of the suspect is obscured at the moment police open fire. In the minutes leading up, police are seen on the video ordering the suspect to throw his gun out the window, stop his car and surrender. 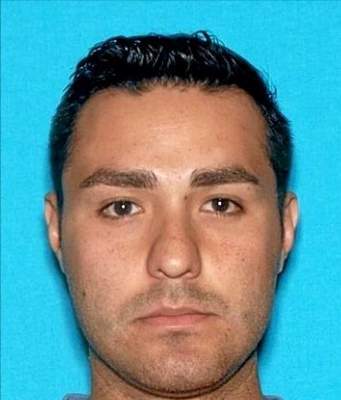 POMONA >> Police seeking a missing rookie Los Angeles police officer who is being sought in connection with a fatal Pomona shooting found the officer’s car abandoned in Pomona on Sunday afternoon, officials said. Investigators found a 2013 Volkswagen Jetta belonging to LAPD Officer Henry Solis, 27, of Pomona just before 1 p.m. at Main Street and Monterey Avenue, Pomona police Lt. Ron McDonald said. The car was parked along the street several blocks north of the scene of Friday’s shooting, which took place about 3:30 a.m. at Main and Third streets, the lieutenant said. Police towed the car away so investigators could examine it in detail for evidence. Police have described Solis as a “person of interest” in the shooting, which claimed the life of 23-year-old Salome Rodriguez Jr. of Ontario. But investigators have not labeled the LAPD officer a suspect in the slaying. A gunman shot and killed Rodriguez during a fight, police said. Witnesses reported seeing a compact car fleeing the scene. Further details regarding the circumstances of the shooting were not released. Solir, who joined the LAPD in June, was assigned to the LAPD’s Devonshire Division, LAPD Officer Rosario Herrera said. Solis has not shown up to work since the shooting, officials said. PHOTO of LAPD Officer Henry Solis courtesy of the Pomona Police Department. HOLLYWOOD >> Police shot and killed a knife-wielding suspect at Hollywood Boulevard and Highland Avenue late Friday, officials said. Few details were initially available regarding the officer-involved shooting, which took place about 7 p.m., Los Angeles police Officer Jane Kim said. The suspect was taken to an area hospital in critical condition and later succumbed to his injuries, Kim said. No officers were hurt in the incident.